Displayed horizontally, vertically, indoors or out, a banner is a versatile and cost-effective way to put your message in any place. 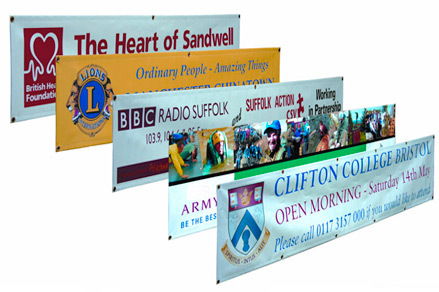 Add impactful design and full-colour graphics and a banner will stand out, get your message noticed and make it memorable. Options include hemming, grommets, and pole pockets. Perfect for promotions and special events, our custom full-colour vinyl banners provide high visibility that attracts and motivates customers. Contact Print Advantage today so you can fly your banner high! Hi Darrin, I've received the banners. You guys are so quick over there! Thank you for being so accommodating. We are very happy with the banners! Indoor and outdoor banners made from 13oz. matte vinyl available in a wide range of sizes, with finishing options that include hemmed edges and metal grommets for hanging.